Tidy Management’s Maxine Mawhinney has contributed to BBC Panorma’s investigation into the Equal Pay Gap which airs tonight. Jane Corbin travels across Britain meeting women challenging their employers for equal pay, from supermarket staff and council carers to BBC presenters, who are fighting for equality – even if the costs run into the billions. Almost 50 years after the passing of the Equal Pay Act, she asks why are women still not being paid as much as men? Maxine tells Panorama “I do know that I have sat beside men on TV doing the same job, probably (with) the same experience or I might have been even more experienced, and I know they were earning more than me.” And asked if she would take a case against the BBC on equal pay Maxine said “If I find that I was entitled to have been paid at a different rate during the time I was there of course I would”. Maxine left the BBC last April having been a senior news anchor for many years. Now a much in demand speaker and event host, conference facilitator and panel moderator Maxine’s new series, ‘The Moment’ is due for transmission later this year. Last year Maxine was confirmed as a senior faculty member at The Karoninska Institute in Stockholm on the Leadership and Communications programme. Maxine Mawhinney helped us to develop a media day for the athletes on our Equestrian World Class Programme who are preparing for Tokyo 2020 and Paris 2024. Maxine delivered a number of interactive media skill sessions throughout the day that gave the athletes more confidence to prepare and present themselves on camera. 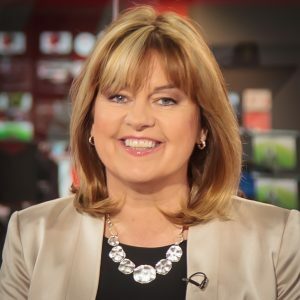 Her extensive knowledge and experience in broadcasting was delivered in an enthusiastic and very ‘user friendly’ style that really delivered key messages whilst maintaining the attention of her audience.